In recent days, the Liberal Police Department has taken several reports of counterfeit money from local businesses. 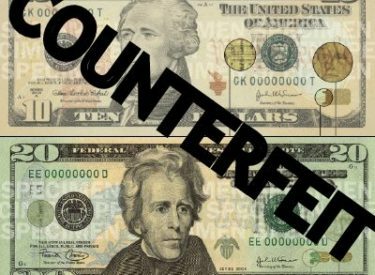 The counterfeit money has been in various denominations with various serial numbers. Please take note of the following tips to spot counterfeit money. The first thing to do is to look at the bottom right corner and check whether the color shifts when you tilt it. By the “20” on a $20 bill, the color is copper, but when you tilt it, the color changes to green(ish). On the new $100 bills, the color change from copper to green happens on the liberty bell symbol. On an authentic bill, there are threads woven in and out of the note. Most counterfeiters try to achieve this look by printing red and blue threads on the surface of the note. If you look closely at their work, you will see that the threads are on the surface. This is usually a copy of the portrait on the note. The watermark can only be seen when you hold the note up against the light. The watermark should be on the right side of the bill and should be an exact replica of the portrait on the note. If there is no watermark when you hold up the note against the light, then it is definitely counterfeited. The security strip runs vertically on the note and can be seen when held up against a light. You won’t find this feature on a counterfeit bill. Compare the notes and make sure that everything is the same, such as the font used to write the serial number, the face on the note, the color, paper, etc. Make sure that the money you are comparing it with is of the same denomination.